At Christmas my friend Tina said "We have known each other for 17 years, did you ever imagine this is what we would be doing 17 years ago?" Well ever since she said this it's been on my mind and I have been thinking, hhhmmm 17 years from now...?? I don't often make New Years resolutions, but I do like the idea of thinking about what I will be doing in the next five years.. at least! and then of course once you have the direction of five years, the 17 comes easier. It's a good exercise to get yourself ready for the coming year. All jokes aside, Good luck and I hope that you come up with something GOOD! Shoot for the moon! I really meant to post this recipe for cardamom rolls before Christmas because this is a traditional thing that we make for Christmas, but I didn't make mine until christmas day so... without a photo--it's not so interesting. My mom usually makes these yummy cardamom rolls and since she didn't make it here for Christmas I was forced to make my own... they were okay, but lacking in my moms secret... I still don't know what it is but hers are definitely better! I think that if you are a baker these will be a snap. Cardamom rolls are a traditional Swedish Christmas treat--cardamom bread or rolls but either way... the smell of cardamon in the house really makes a cold snowy day fell like a Holiday. This year I ended up making six loaves of cardamom bread and then this one batch of rolls because I know the kids couldn't live without them! The loaves are beautiful because I braid them and this turned out to be my gift to my friends this year (sorry forgot to photograph before I gave them away!). It was my first time baking bread and I thought it was really fun and much easier that I had anticipated. Melt butter in a saucepan. Add the milk and heat until lukewarm, around 100F. If using active dry yeast, heat to 115F. Crumble the yeast in a large bowl and add some of the milk mixture, stirring until disolved. Add the remaining liquid, salt, sugar, cardamom and around 2/3 of the flour, mixing to combine. Knead the dough until smooth and elastic. Add more flour, but reserve 1/2-3/4 cup. The dough is ready when it no onger sticks to the sides of the bowl. Sprinkle a little flour over the dough so that it doesn't dry out. Cover with a cloth and set in a warm draft-free place. Let rise until doubled. Punch down the dough and knead it into he bowl for a few minutes. Turn out onto a lightly floured surface. Knead in the remaining flour. The dough is ready when it no longer sticks to the sides of the bowl and hands. If the dough is cut, the exposed surface should have even pores. If there are big holes, it hasn't been kneaded enough. Grate the almond paste and mix with the cardamom and butter until smooth. Divide the dough in half. Roll each half into a flat rectangle on a lightly floured surface. Spread the filling over the dough. Roll up and cut into even slices. Place them, cut side up, in paper baking cups or on a parchment-lined baking sheet. Bake on the center oven rack for 8-10 minutes. I hope that you enjoy them!! and if you have any suggestions or want to make a comment on how yours turned out please let us know!! I thought I would share with you the HUGE mess that I make when I bake.... somehow it feels more festive when it's a mess! I was just checking in with my friends blog 'Pretty Mommy' and in a compilation of things that she wrote about her experience with having a baby - which she so sweetly calls: letter to new mamas she talks about a wonderful place in Minneapolis (yes we Minnesotans look out for each other!) called Blooma. Blooma is a wellness center that offers prenatal and postnatal yoga, wellness and education for the new parent and expecting parent. I LOVE THE SOUND OF THIS PLACE!! how wonderful and what a great idea! I wanted to write about Blooma to tell you all about them because I think that this would be such an empowering place when you about to have a baby. It's so great to have a place to get together with other pregnant women or just after you have your baby for yoga, you will probably find your friends for life here... It's great to be able to ask questions and talk to other parents in a similar situation and if you are searching out a place like this you can imagine that everyone at Blooma has a healthy and supportive approach to breastfeeding, exercise and eating which all go hand in hand with having a new baby. I would also suggest that if you don't have one in your town... maybe this is a good opportunity to open something like this in YOUR town??!! talk to he women behind Blooma and I am sure that there is a lot of love and support there! I am on the 'culture committee' at my sons school, it's nice to be a part of the school and it's a bit of involvement but not too much AND I like to see what we can get as far as some fun acts and music into his school. A few weeks ago we were lucky enough to have Len Cabral come and share his particularly exciting storytelling, it was WONDERFUL! If you need anything like this at your kids school or event, the kids were mesmerized by Len's stories he is very charming with the kids and they were entranced (and so was I!). He had the kids screaming and helping him tell the stories together with him and everyone had so much fun. We split up our rather small school into two groups with K-2 in one group and 3-5 in the other, this way Len could tell stories that were appropriate for each and I can tell you I stayed for both and loved them, the teachers loved it and our principle was ecstatic! He will have you laughing and cheering for the spider to pull down the sky with her web and in the next story you are on the edge of your seat when he tells his own delightful stories of ice skating and hot potatoes! He is wonderfully charismatic and I love how he pulls a story out of the smallest things and makes it enrapturing for kids. 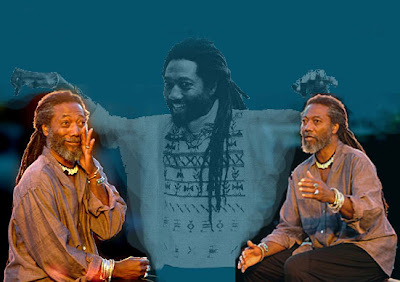 Len Cabral is a Rhode Island Storyteller but he travels the world sharing his stories with kids and adults! Have a Happy Holiday and Lovely New Year!! I just had to share this lovely Holiday card that I received from Makié! Somehow with all of the hustle and bustle I have totally forgotten to blog! It just slipped my mind... We made our yearly pilgrimage to NYC with the kids for Christmas last weekend, we like to do the Tree in Rockefeller Plaza, drive through times square and all the lights, go to Balthazar and have breakfast, and charge around Soho with all the shoppers and stop in and have hot chocolate. This year we had the added boost of the winter storm that blew through and dumped about 14 inches of snow! 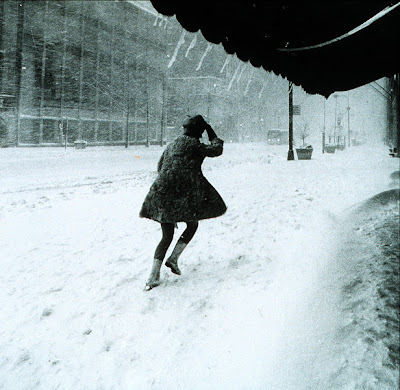 My husband and I were determined to go out in the snow for a dinner together just the two of us, even though there was a giant storm (we were covered with snow!) we ended up trampling around to three places before we were able to find a restaurant with a table, we had a lovely night at Cafe Cluny. We had a beautiful dinner while we watched the blizzard outside... it was perfection! 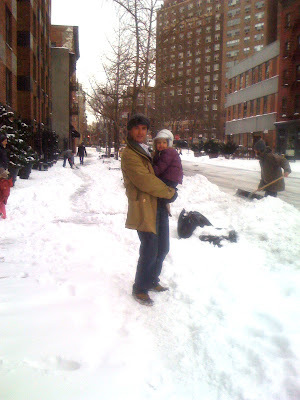 The next morning, it was so exciting, my son and I took the dog out at 7am (no other New Yorker was out except a few other dog walkers) and it was a pure white New York City, really a treat! We ran around and had a great time, when we went out again at 9am it was already mayhem with cars stuck at lights and the white snow had already turned a bit brown and slushy... it was a winter wonderland while it lasted! We got together with my favorite friends, the women of Kit+Lili and Jann from Lucky Fish...the kids were amazed by the exhibition that is currently on at The New Museum on the Bowery (I happens to say "Hell Yes" outside and my son seems to think that's pretty funny). The exhibit is Urs Fischer: Marguerite de Ponty and it offers a family kit with questions for kids that will help them think like the artist like "if you blew up something in your home to bigger than life size what would it be?"... don't miss it! We wanted to get home for a Christmas party that we were supposed to go to in Rhode Island and we had drifts of snow in our driveway that were up to my hips! Instead of a party we spent four hours shoveling out..ha! But it was beautiful and the kids had a blast, by the morning our son had dug a trench all the way around our house for our new dog (now all he can do is run the circle around the house!). It's so exciting to have a white Christmas... I just wanted to share a bit of winter, blizzard and snow. 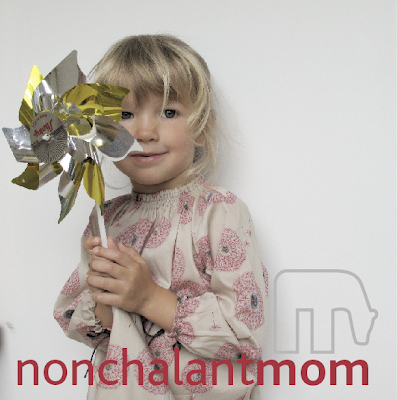 nonchalant mom on Designing Moms! Designing Moms is a blog created by 19 creative and talented women. They each bring creative projects and ideas to your life, things that you can use.. and their tag-line says it all "We invite you to come and be creatively distracted with us!" (I love that...I mean let's be honest, there is nothing more distracting than a really good blog!) or "A space for creative moms to unite", enough talk.. you will love the blog and I hope that you get as many ideas that I do from them as I do. Thank you ladies for letting me be a part of your terrific blog! (I will contribute with shopping blogs.. oh what a nice category for me!). My friends Julie and Jess at Verre (as in French for 'glass') have created this terrific sly on the initial necklaces that have consumed everyone, including me! We were talking one day and I asked if she could come up with a away to do the initials that was the Verre version... and POW! did they... I love the way these pieces look (and feel) and together with other charms they are simply.. charming! We decided it would be fun to make them look like candy! I like to mix the classic colors gray or white together with crazy pinks, greens and reds! The result is perfect... We edited a small color card just for Nonchalant Mom and introduced them last week and you obviously loved them so we are extending the final Christmas ship date to this Friday, December 17th (but you need to request 2-day delivery!). 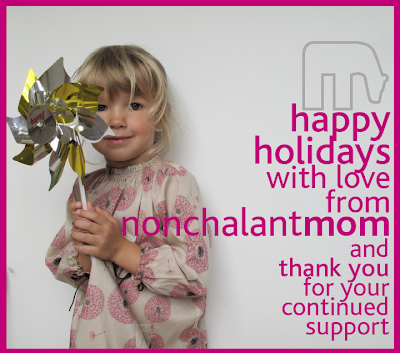 But we will always have them on Nonchalant Mom (and exclusively at Nonchalant Mom I might add!) and I will not let them go! Verre wraps them all up in a beautiful glass jar - Verre - let them wear glass! - which I think is such beautiful packaging. Beautiful Maine shrimp arrived on Monday of this week and they look so fresh and beautiful that we got some right away! Maine shrimp is nice and small, it's great for kids and you can fix it in just about any way and they are delicious. I don't like to buy shrimp for the family because it's usually from so far away, never mind the conditions they were caught under, but the trip all the way to your table is too far! serve on top of arugula and it makes a nice warm salad! drizzle with olive oil! yum!! what are your recipes!? please share with us!! but run out to Whole Foods (or where ever you get your fresh fish!) and get your FRESH MAINE SHRIMP! Store Hours :: December 15 - 18! I am planning to be in the store this week just in case you need a last minute gifts or a special holiday outfit! (for mom or your kids!). I have had a bunch of calls from people wanting to come in so I wanted so send out a general message of my hours for this week! If you want to come outside of these hours please feel free to call me and I can certainly accommodate your schedule! I hope to see you here and if not HAPPY HOLIDAYS!! 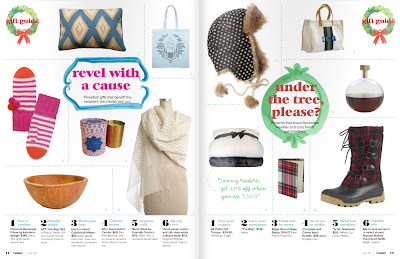 lonny december issue online now! I just perused the December issue of the new Lonny magazine and it's just as inspiring as the first issue, and with their targeted fun gift guides they are even better. 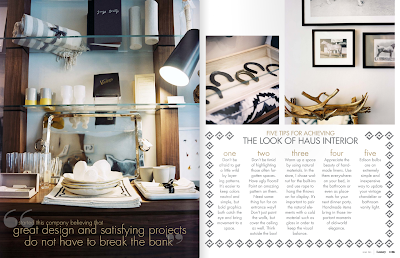 This issue includes the homes of some young and exciting interior designers and their work that will inspire you! I fell in love with all of the hues of camel and sand in some of the homes, together with white it looks so new and clean, I really loved it. Although our home has a lot of color I am sure there is a way that I can use these colors in our house. It took me awhile to figure out what Lonny actually stood for, kind of a crazy name for a magazine, but it's a combination of London and New York. 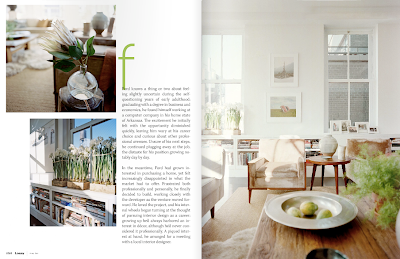 Although in this issue they should call it Panny as most of the homes featured are in Paris (but I'm not complaining!). A well appointed Paris apartment has always been inspiring for me, the mix of old and modern in a very casual way, I think that this feeling can be brought into any home style, be it a Country home, a Cape or even a New York apartment.I think a visit to Haus Interior would certainly help! 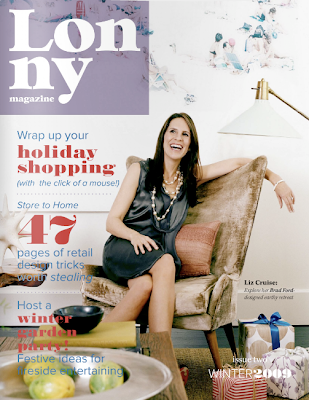 I hope that this issue of Lonny leaves you with some fun ideas to make some changes in your home, it sure did for me! And did I mention that I would love to have Brad Ford come and take a look at my house and give me so hhheeeLLLPP! (on my decor that is...). The issue looks a lot like Domino, and I would have to say I like it... but you be the judge and YES there is Nonchalant Mom with a little ad... love it!! I know that many of you are going away for the holidays or just there afterward so I thought it was a good time to mention a swimsuit -- which I think is THE swimsuit I have always been looking for, funny I was looking in the wrong places, like the second-hand clothing shops! And there it was, someone told me she had just bought this swimsuit, the description was just too close to my dream suit, then I went to the website of 'Mama Maria'! Her inspiration is obvious, 1950's film stars. Even if you are not in the market for a new swimsuit you must check out her website. This Amsterdam foxy lady knows a swimsuit when she see's one, or should I say creates one! 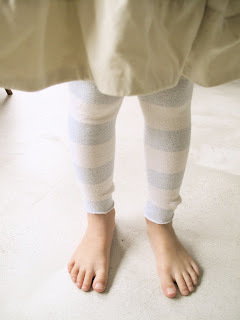 I think that some of you will think that these are vintage but I assure you they are a classic look in modern fabrics--I think that sounds just about perfect. 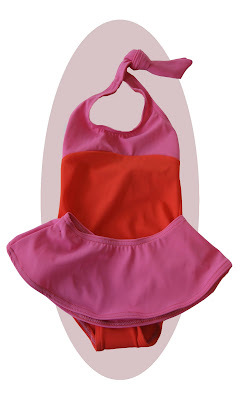 You can get a swimsuit for yourself and your little one too! (somehow when it's a swimsuit I don't mind this idea!) Mama Maria has some great tricks up her sleeve and her suits are really the bomb! She makes these delightful swim caps that are too much fun! I remember having one that was orange and pink, and I am sure that my mom had this white one! click here to visit her website - Mama Maria! Time : 10 a.m. - 5 p.m. 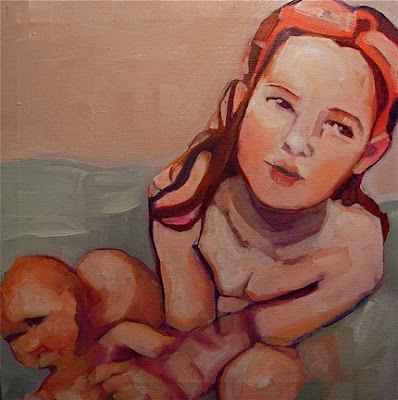 I just got an email from my friend Ruth Shively who is a very talented painter (she also does portraits!). Just in time for the Holidays she is offering a collection of wonderful paintings that are priced just right for gift giving (a nice way of saying affordable). 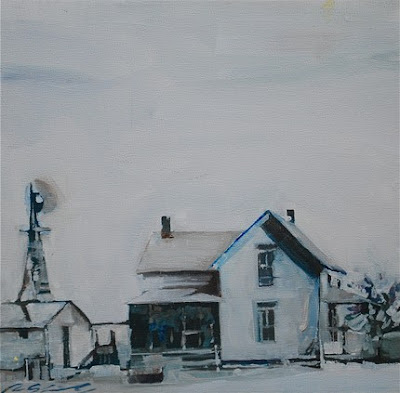 I love the clean and sparse look of her paintings of which include landscapes as well as portrait work. I have written about this artist before, her name is Diem Chau and she does the crayon sculptures that I really love! 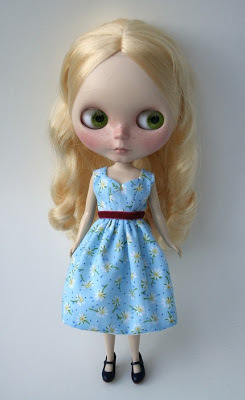 On a visit to her website I found that she also makes these fantastic Blythe dolls and doll couture.. it's amazing! 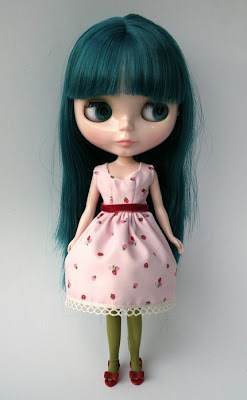 Diem has been customizing Blythe dolls for years now and she not only makes custom clothing she actually customizes the actual doll, here is a description of her work. "The first animated movie I saw as a child was Disney's Pinocchio, no I’m not that old… just a little behind :P I loved the idea of creating a doll that comes to life. 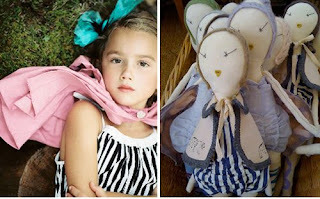 I see each doll I customize as an object waiting to spring to life! Most of the time I don’t plan out the results, I just go with it. My aesthetic lean towards subtlety and natural colors, but sometimes a special request can be fun and challenging. My goal is to give them a lively energy and enhance their personality. I’m a working artist and my schedule is quite unpredictable. I will only work on one doll at a time. Please feel free to contact me for commission availability. I don’t have a menu of services, it’s just $200 flat for a complete custom job. That includes head opening, sand matting, carving, new face-up, eyechip changes, haircuts, trims and bang/hair taming… basically everything but reroots. I will do wefted reroots, but that’s extra." I think that these would make a really amazing gift for a girl and a real treasure. 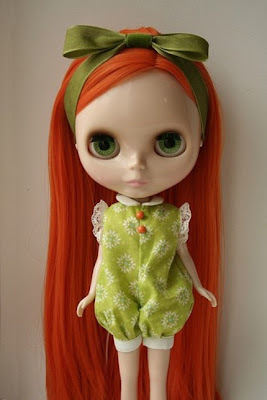 These Blythe dolls are collectible and you can buy clothing for them by Diem on her etsy website. 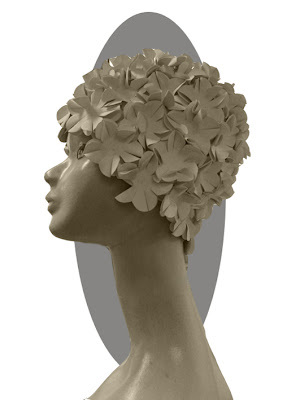 watch her film to see details on her work and a window onto how a doll transforms! It's really beautiful. Somehow I never take care of my window on main street here in our little town of Wakefield, RI -- but last night was 'ladies night' (so much fun!) and so I figured it was time to make something festive. 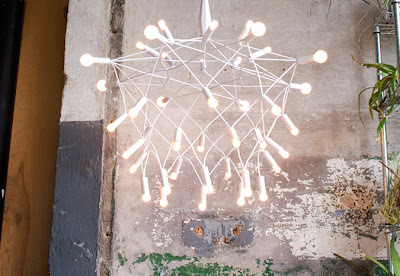 Besides, I have been looking for a place to hang this wonderful 'orbit chandelier' by Patrick Townsend (which you can purchase at nonchalant mom now.. ha!) which I have been in love with for years now and finally just dove in and got them for the store! My kids and I cut out the stars from old boxes (you know I have a bunch of those!) and spray painted them silver... I think these would look super cute in any window of your house as well. We were inspired by all of the starry, starry nights we have been having -- clear skies, big moon and lots and lots of stars! And then we just filled it with our favorite kids clothes! and ah... the Orbit Chandelier! 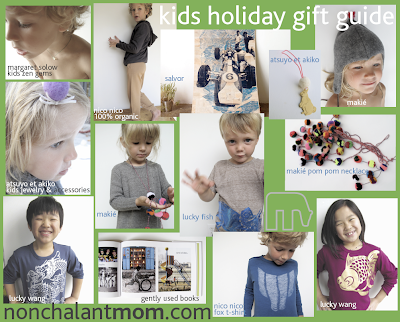 nonchalant mom :: kids holiday gift guide! 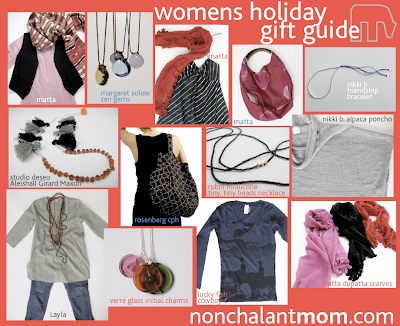 visit nonchalant mom for more gift ideas! just opening a box of Matta! It's the simple things in life that make me happy! 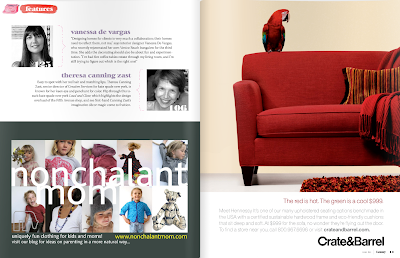 The new issue of small magazine is out and I love it! 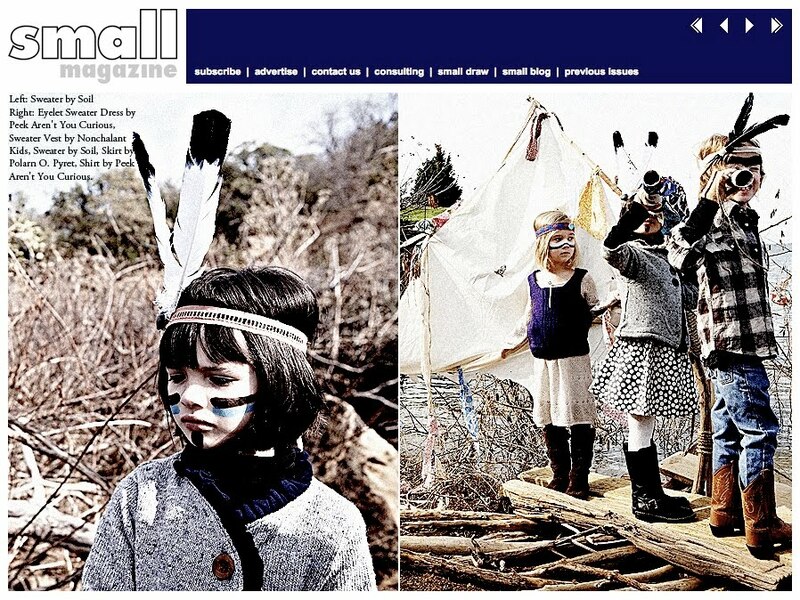 Always so inspiring and this issue just keeps you going... and nonchalant kids was a part of it!! yay!! Our super splendorous purple hand-knit vest--we are excited to make the issue (click here to shop) - thank you small magazine for being so wonderful! click here to link to new issue! - read it an weep! Happy Thanksgiving!! and giving some thanks! I hope that you have a beautiful day with your friends and family! 15% - 20% off: JEWELRY - verre, nikki b, studio deseo, robin mollicone, margaret solow NONCHALANT KIDS - entire collection on sale! PILLOWS - rosenberg, lucky fish, gunn britts pillows, hable SWEATERS - all sweaters 15% off! 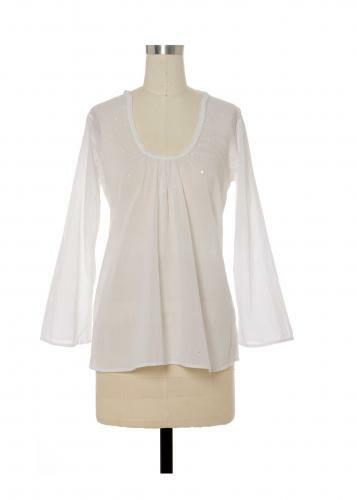 Visit our homepage and follow the "SALE!" Thanks so much for a wonderful year and we are planning more and more exciting things in the coming year! I received this story from my friend Lesley, she is the co-designer (together with her twin sister) of the collection: kice kice. We have had a kind of ongoing kinship about food but when she shared the difficulties she had with her first child I thought this would be great blog to share with everyone. I hope this is a big help to you and I know that even knowing about it and being able to reference friends to her has been helpful! She has a vast knowledge after working with all three of her kids on various food allergies. The good news is that her middle child grew out of her trouble and her oldest has gotten much better. Lesley's story: A few months after having my first child, I discovered how changing my diet greatly changed the quality of our life and my daughter's happiness. Often times, babies have an intolerance to certain foods, and eating these foods while breast feeding is essentially feeding that to your child. Using the elimination diet, I have found what works best for my children and have realized how important it is to listen to my body and feed it nourishing and supportive foods. While the diet can be a bit difficult at times, this inconvenience greatly outweighs having an unhappy baby. This is how I discovered this process and the progression of my diet with each child. After giving birth to my first child I had a natural connection to her; taking care of her seemed fairly easy. Two weeks later she began to get fussier and I spent the next two months of my daughter's life holding her, bouncing on a ball, walking around, or doing squats to keep her happy. She would only sleep in my arms. Every time laid her down she would pull her legs up and cry with a piercing cry. This was my first child, I did not know this was not normal and wondered why no one told me babies were so much work! My mother came to visit at one month and was concerned about my daughter's stomach because it was always tight. She told me my daughter seemed like she was in pain. My daughter was exclusively breastfed so her poop was supposed to be thin, but it was almost like water with little seeds on top. We went to the pediatrician who told us everything was fine; the seeds on top indicated it was not diarrhea. A few weeks later while changing her diaper I found blood in her stools. Her pediatrician told me to eliminate diary from my diet: to read labels carefully because there are many things such as casein and whey that are derived from dairy. Two months later her poops were better but her crying had intensified. My pediatrician who told me my daughter was reacting to the heat of the summer. I told my pediatrician it still felt like something was wrong, she replied by asking me if this was my first child. I left feeling like an over-reacting first time mother and continued our routine holding, bouncing, and doing squats with her. We went on our first family vacation. Eating out was difficult because I am a vegetarian. I had to find foods that were dairy free and ending up eating mostly just salad. Much to my surprise my daughter was much happier and stopped crying all the time. I had tofu one night and spent the whole night holding my daughter. It was apparent she was also reacting to soy. When I eliminated dairy from my diet I increased soy to add more protein. This is when I learned about MSPI (milk, soy protein intolerance). It is an intolerance to the protein in dairy and soy that is passed through the breast milk (or formula). If the baby is sensitive he or she will be colicky. Dr. Sears has an elimination diet to follow if you think this is the case. Most babies outgrow this intolerance from 6 months to a year. Mine was very sensitive and still has problems with too much dairy or soy (she is 5). I eliminated diary and soy from my diet before giving birth to my second daughter. She was much happier than the first baby. After a few weeks she had very bad acid reflux. She could not sleep on her back; she would spit up and choke on it. I had her sleeping in a slightly elevated bouncy chair. I talked to my doctor about this (a new doctor who is sensitive to food intolerance). She told me we could try medication or I could eliminate a number of things from my diet. I went on the elimination diet and slowly started adding foods back into my diet. I found out corn was causing her acid reflux. She would also break out with eczema when I ate rice or potatoes! By the time she was 6 months old she had outgrown this. Now I have my third child who is 4 months old. I began breast feeding with a restricted diet. She began sleeping through the night at 2 weeks and is much happier than the other two babies were. I pay close attention to what I have eaten if she becomes fussy or starts spitting up more. It is very important to talk to your doctor about food elimination if you think you are having a problem. Remember to keep your diet healthy. Through this diet I have a better understanding of what makes up the foods we eat on a daily basis: eliminating these foods eliminated most processed foods. If you child is sensitive to dairy, keep in mind that beef has the same protein as dairy. I have been able to find lots of recipes as substitutes for my favorite foods. Coconut milk is a great substitute to cow's milk and makes really creamy ice cream. The most important thing from all of this I learned was to follow my instincts. I had suspected this was not normal from the beginning but listened to my doctor who questioned my experience as a mother. If your doctor won't listen to you, find another doctor who will. This is a growing problem with babies and food elimination will make your life much easier if your baby has a food intolerance. Keep an open mind to this process - once you know what you can eat, it's just a matter of being disciplined. Thank you very much Lesley! 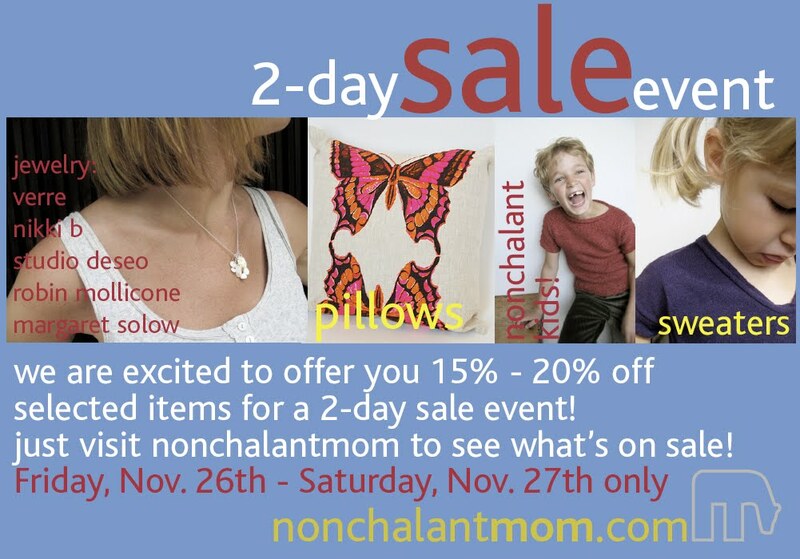 If you want to see the Kice Kice collection on Nonchalant Mom click here. Erica Tanov in NYC is hosting a holiday pop-up-shop of two of my favorite designers (both of which are on Nonchalant Mom - click here) Wovenplay and Jess Brown Dolls. If you have not already been to Erica Tanov it is always on my list to stop by and say hello while in NYC - it's always super inspiring! 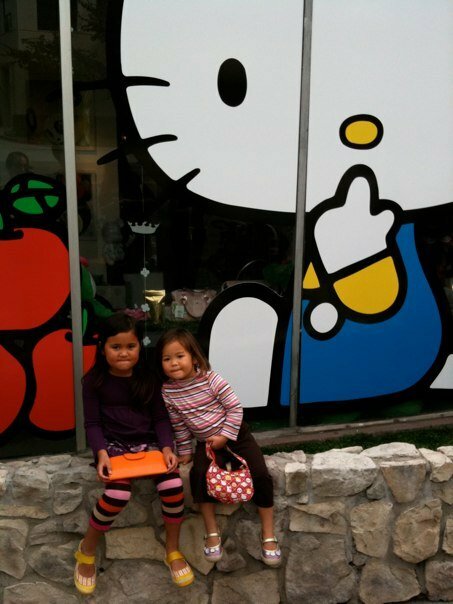 (and a great place to pick up a little something for kids from NYC). stop by for cocoa and cookies and have some fun!